Creating mind map with free templates and examples. Mind Map has never been easier. A mind map is a graphical representation of ideas or topics in a radial, non-linear manner. Mind mapping diagrams are used to visualize, organize, and classify ideas, making them perfect for study aids, organizing information, problem solving, writing and making decisions. The term "mind map" was first popularized by British popular psychology author and television personality Tony Buzan. Since then, mind mapping was widely used in the area of both business and education. In business field, mind mapping helps the organization to brainstorm products, set strategy, plan projects, and more. In education field, mind mapping helps students to retain information through interactive learning. 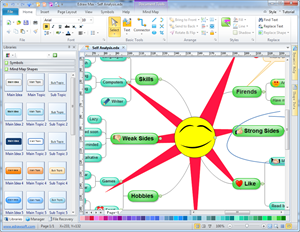 A typical mind mapping diagram focuses on a central key word or topic, with other items linked to and arranged around the central topic. Mind mapping diagrams consist of words, images and additional media rich content, enhancing the effectiveness of the mind mapping diagram. With Edraw mind mapping diagram software, you will surely gain greater creativity when brainstorming ideas and documenting information, or planning for a project. For more information, you may go to ultimate mind mapping diagram tutorial page to get details. Also, learn how to create career planning mind map here. Create mind maps (graphical representations of thought processes) for brainstorming, problem solving, rational analysis, and decision marking. Create concept diagram for showing the relationships among concepts. Create bubble diagram for mind mapping. Edraw Mind Map is a mind mapping application with inbuilt templates and examples which makes it very easy to use. You can easily draw your visualization and associated ideas with this program's power packed features. It has a large collection of mind map shapes and examples, allowing you to drag and drop any shape you want. By using the smart buttons on the shape, you can easily collapse or expand a topic. You can also add images, symbols, tables and hyperlinks to your map. It supports big size and multiple page mind map. What's more, it has various embedded features like inbuilt themes, effects, styles; automatic alignment, compatible with MS office, easy to share and much more. No other way is more convenient than Edraw in creating Mind Maps. 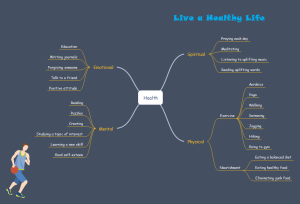 This mind map illustrates some of the important factors on how to keep a healthy life. Download this ready to use template to help with your own mind map design work. Mind maps are a great way to start your activity planning. In this barbecue activity plan, massive information could be well represented in a single diagram in a clear and organized way. 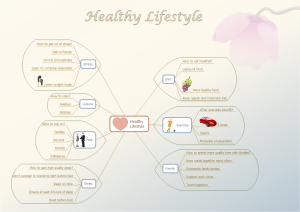 A unique mind map template about healthy lifestyle is ready to use in vector format. It is organized and clear with boundaries around different topics. This kind of mind map is used to represent award criteria. 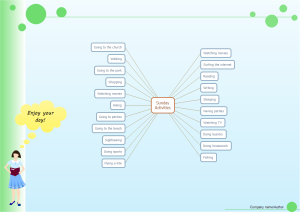 Use the example as a template to start your own mind map designs in minutes. 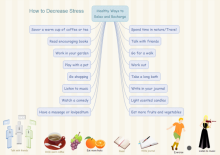 Learn healthy ways to decrease stress in the right mind map. This template is laid out in a neat and special way. 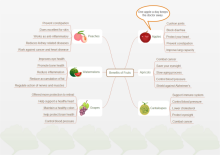 This mind map present some fruits' benefits. Visualized by vivid clipart, it becomes more sightly. See more diagrams enhanced by our vector fruit clipart. This simple mind map shows some types of personality in terms of their behavior. The symbols in the shapes are glued, meaning that when you move the mind map, the symbols still remain glued with the shapes.